Dez Melenka from CTV News Edmonton met us along the line to hear more about our proposal. Watch the full On Your Street story here. 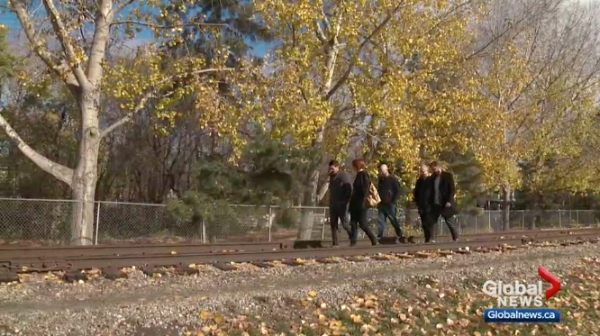 Kashmala Fida from Metro News Edmonton covered the story of High Level Line! A group of Edmontonians have pitched an ambitious idea to use green space to link downtown with Old Strathcona. 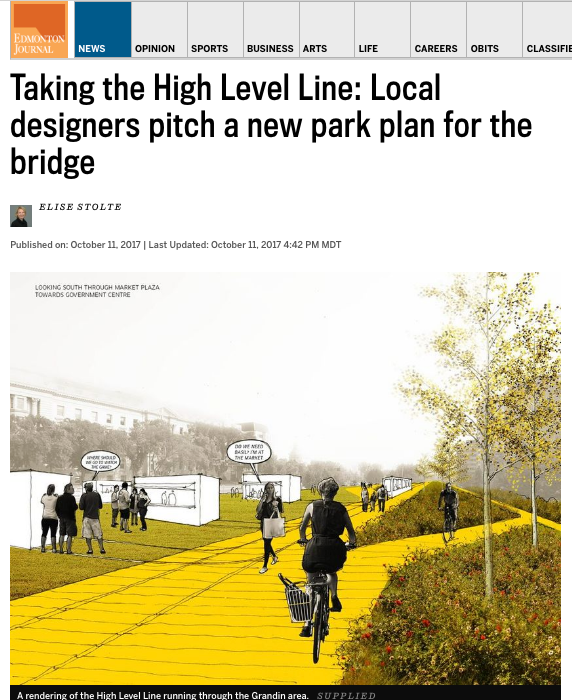 The High Level Line project, which would see a 4.3-kilometre strip of parkland run from north of Jasper Ave to Whyte Avenue, is the brainchild of a group of architects, landscape architects, engineers and urban planners. “The river valley, as amazing and beautiful as it is, has long acted as a barrier between those two areas,” said landscape architect Kevin Dieterman. We joined Mark Connolly on CBC Radio Edmonton AM to talk about High Level Line! 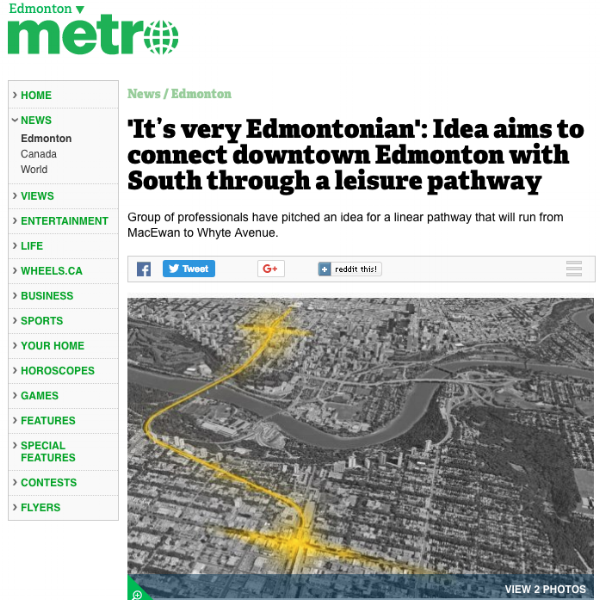 Elise Stolte from Edmonton Journal shared our proposal with the city! 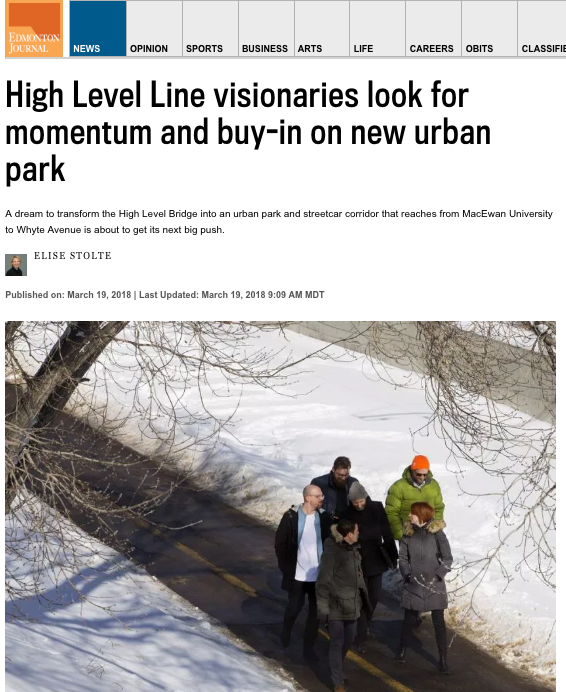 A group of young Edmonton professionals is pitching a new vision for the High Level Bridge that would stretch the park experience from Whyte Avenue right to MacEwan University. “The bridge is only a quarter of the length of this opportunity,” said landscape architect Kevin Dieterman, who spent a year designing a new urban park for the area with a half-dozen other individuals. The group wants the streetcar — a much slower form of public transit — to run through a four-kilometre park and cycling space, creating a mixed-use and pedestrian park similar to what’s found in some areas of Europe. “It’s really about connecting the downtown and south side, the two cultural hearts of our city. It’s really, really rich,” Dieterman said Wednesday after the group released an initial plan at highlevelline.com this week. 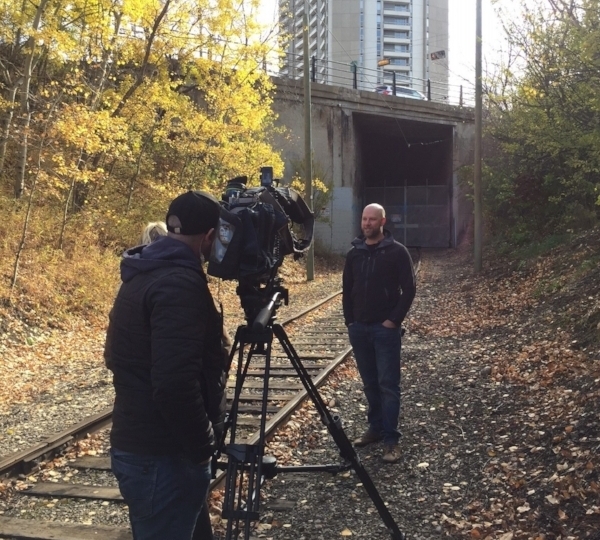 CBC News helped spread the word about High Level Line on the first day it was released! Note about the article title: We're not all architects, but there's some on the team! A local collective has a bold new vision for central Edmonton that includes a park that would connect downtown with Whyte Avenue. [Intern] Architect Michael Zabinski, along with a group of young creative and design professionals, has been working on the High Level Line project for a year. Their proposal includes a four-kilometre park made up of pedestrian paths, a cycling network, and a streetcar to connect downtown to Whyte Avenue, putting a fresh, user-friendly spin on the neighbourhoods between them. "We are a city with two really awesome cultural centres, downtown and Whyte Avenue," said Zabinski. "And for the longest time, people have gone to Whyte or they go downtown. What's missing is the link between the two — the urban thread that makes central Edmonton one place and one destination, that connects the city's two centres and creates a dynamic experience between the two."